Today I'm over at Ch-ch-ch-Chachic's place losing my crap over Eugenides and Megan Whalen Turner's Queen's Thief series in general. Chachic invited me to talk a little bit about how I've gone about convincing others to read this wonderful series, and I happily accepted. I mean, talking about talking about books? Count me in! Bibliovangelizing is one of my very favorite pastimes and these books have caused me to indulge in quite a lot of it. This is one spectacular event Chachic's organized and the posts so far have been top notch. Do drop in and say hi, won't you? Ch-ch-ch-Chachic -> LOL at this. Thank you so much for agreeing to do a guest post, Angie! 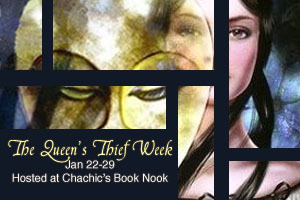 I love that you love the series just as much as I do so you understand the reasons behind Queen's Thief Week. It has been amazing so far. Glad you liked it. It really has been such a successful event! Bibliovangelising is a much nice way to say book pimping! Due to Queen's Thief Week, I checked out the audio books of THE THIEF, THE QUEEN OF ATTOLIA, and THE KING OF ATTOLIA and am listening to them in my car. I'm loving the narrator and listening to the stories.